Lima has undertaken the challenge to host global events of great magnitude such as 2015 World Bank Group and International Monetary Fund (WBG-IMF) Annual Meetings, APEC 2016, Pan-American Games in 2019. These and many more top-class events will give an opportunity to showcase Peru's strong position as global event organizers and increase their ranking as destination of choice to hold other international events. To further heighten their attractiveness as a conference destination Lima has constructed a world class Convention Center, Peru's largest tourist infrastructure project. With claims to be the largest in South America, it's sure to become a strong contender to more established conference destinations in the region. Lima Convention Center’s opening event was no less than the World Bank Group and International Monetary Fund Annual Meetings 2015, placing Lima in the center of international attention in the world of economics. The event brought together ministers of finance and central bank governors from 188 member countries, the largest event ever to take place in Peru. Marking also the return of the Meeting to Latin America after 48 years. 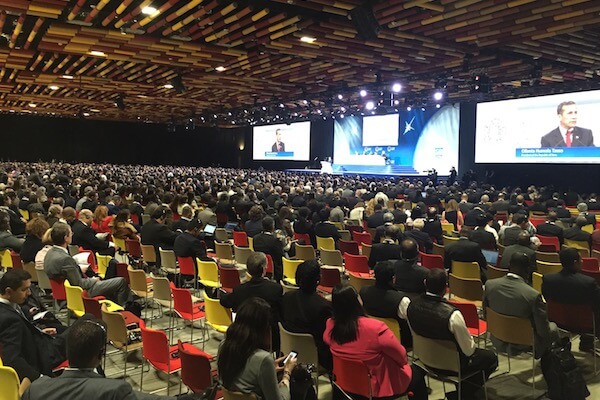 As the central venue for the event, Lima Convention Center held the top meetings of the summit including the Development Committee Plenary, IMFC Plenary and the Annual Meeting Plenary presided by President Humala. Various country Groups, such as the Group of Twenty (G-20), the Group of Twenty Four (G-24) and the Commonwealth also took the opportunity to hold Ministerial-level meetings, press conferences, press briefings with Governors and bilateral meetings to discuss the world’s financial markets. Conference Rental is immensely proud to have contributed to these Annual Meetings with the provision of conference discussion and simultaneous interpretation solutions for 198 meetings in 20 rooms in a top-quality venue. The Conference Rental’s team, composed of 40 professionals from seven different countries, worked hands in hands with event managers and technical experts from Presentation Services Audio Visual (PSAV), entrusted to handle all technology services for this event. This thriving partnership based on technical expertise and extensive experience contributed to a very successful event. Conference Rental expands its Latin America footprint with this important event, which adds to the portfolio of top international events delivered in this part of the world such as the ITU Plenipotentiary Conference in Guadalajara, the Global Forum on Migration and Development in Puerto Vallarta, the G20 Mexico Summit, and the Ibero-American Summit in Panama, to name a few.